The USTA today announced that six of America’s top 14-and-under juniors, including 2016 USTA National Clay Court singles champions Zane Khan and Alexa Noel and 2016 Les Petits As champion Stefan Leustian, will look to lead the U.S. in the World Junior Tennis Finals, the world’s premier 14-and-under team competition, August 1-6 in Prostejov, Czech Republic. Each three-player team will compete with 15 other nations from around the world, first in round-robin matches, then in a knockout bracket. More information can be found on the International Tennis Federation’s website. Twin brothers Zane and Faris Khan played each other in the Boys’ 14s USTA National Clay Court Championship singles final last weekend, with Zane winning. They also won the doubles title together. 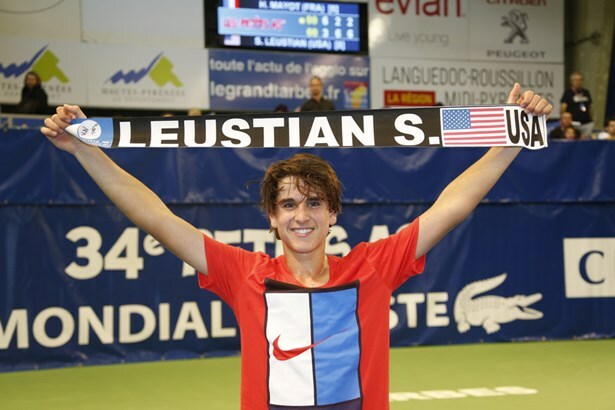 Leustian won the singles title at the prestigious Les Petits As tournament in Tarbes, France, in February. Noel won the singles title and reached the doubles final at last week’s USTA Girls’ 16s National Clay Court Championships, where Ong was a quarterfinalist in both singles and doubles. Osuigwe reached the final of the USTA Girls’ 16s national hard court championship last summer and made singles final and semifinal appearances at two ITF junior tournaments this May in Plantation and Delray Beach, Fla. The U.S. girls finished second and the boys third at last year’s World Junior Tennis Finals. The U.S. has won six World Junior Tennis girls’ titles (1992, 2007-10, 2013) and four World Junior Tennis boys’ titles (2002-03, 2008, 2012). Former U.S. junior international team members include Jim Courier, Andy Roddick, James Blake, Lindsay Davenport, and Sloane Stephens. Roger Federer, Rafael Nadal, and Novak Djokovic also have represented their respective countries in junior international team competition. To see all results click here.